Only 60% of working age people with a long-term health condition are currently in employment, according to statistics published by The Work Foundation. 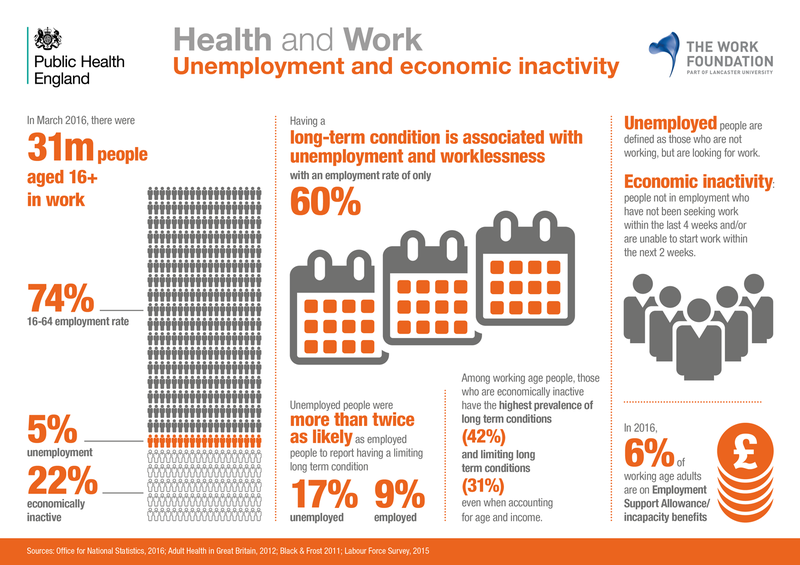 And unemployed people are more than twice as likely as employed people to report having a limiting long-term condition (17% unemployed, 9% employed). Long-term conditions are conditions that cannot be cured but can be managed through medication and/or therapy. They include a broad range of medical issues, for example asthma, diabetes, cancer and arthritis. Advances in treatment and an ageing population mean that many more people with a long-term condition are able to continue working. NHS guidance for line managers on supporting employees with long-term medical conditions reveals that remaining in work can in fact help to reduce the impact of the condition on the employee and simple adjustments at work can make a big difference in helping the person to stay at work. According to the guidance, in many cases such changes are cheap and easy to make. Where a medical condition causes disability, grants may be available to help employers make such adjustments (for example via Access to Work). Legislation supporting those with a disability will also apply to many with long-term medical conditions. This includes accommodating visits to hospitals or other medical appointments. Ideally, the HSE says, employees should not normally be required to take annual leave for matters relating to their long-term condition, such as medical appointments, but employers should discuss all the options. This series of infographics is intended to help raise awareness and understanding of the relationship between health and work. Produced and published by Public Health England with support and input from The Work Foundation.